Famous for its maple syrup, harsh winters, and unparalleled natural beauty, Vermont is a popular destination for Americans looking to escape their chaotic and stressful lives in east coast cities like Boston, New York and Philadelphia. As a child, my family vacationed in Vermont many times, making the long drive up from Maryland. We always went in winter, because Vermont is known for its great skiing, but it’s also home to quite a few spectacular waterfalls, nearly all of which are easily accessible. 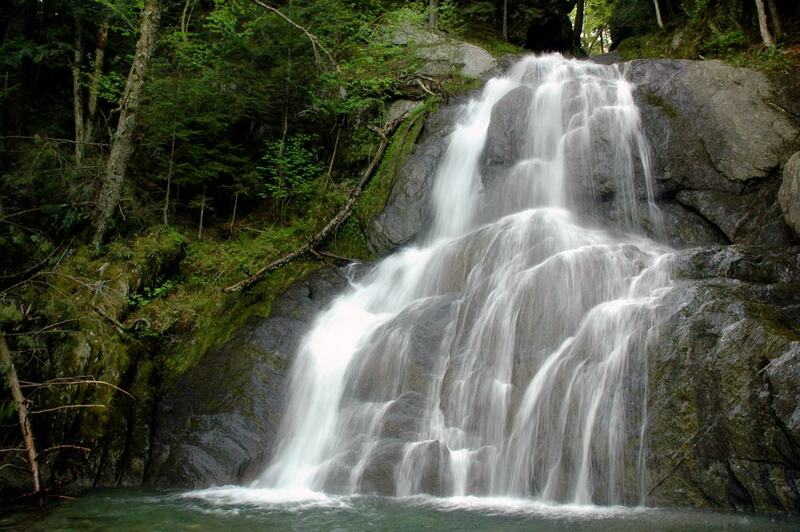 Below are 15 of the most amazing falls in Vermont. 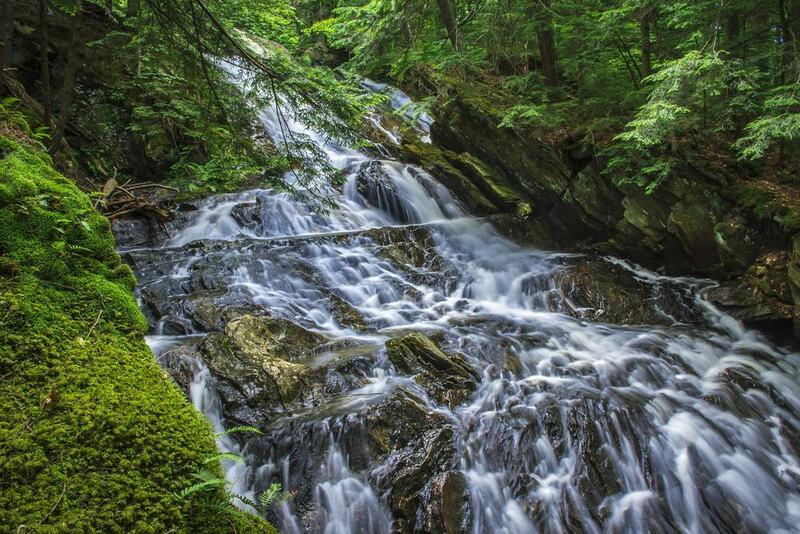 Near the top of the list for Vermont’s largest waterfall, Moss Glenn Waterfall in Stowe is a magnificent, multi-tiered fall set amidst beautiful mountains. 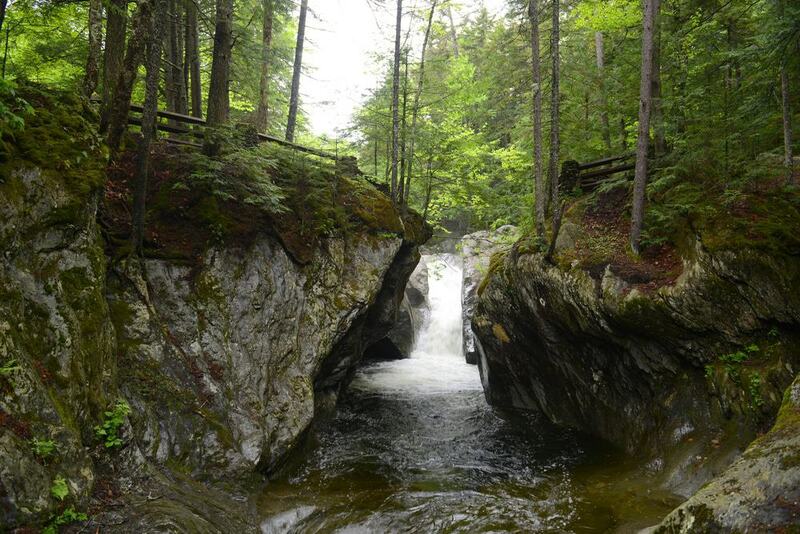 It’s nearly 125 feet tall, and like most of Vermont’s falls, it’s easy to get to. Though the water is downright cold year-round, the fall is a favorite haunt of locals and visitors looking to cool off in the summer. The fall can ice up in the winter, and in the summer the flow can be reduced, though the pool is usually full. The town has great restaurants, shops and galleries too, so leave a little time to check it out before hitting the road. At 125 feet, Lye Brook Falls are among Vermont’s most dramatic, and are found in the Green Mountain National Forest in Manchester. The falls are reachable after a lengthy hike of nearly 5 miles, and though it’s long, it’s only moderately difficult. Cascading their way down hundreds of tiny steps in the rock, the water constantly makes sharp, angular turns giving the falls a unique look. Because of its seasonal nature, the falls are best seen in the spring, when they’re at their greatest flow due to snowmelt in the nearby mountains. Just a stone’s throw from the border with Canada, Big Falls are in Big Falls State Park on the Missisquoi River, near the town of Troy. Though the falls’ total drop is only about 40 feet, their true majesty lies in their pristine natural setting, and the power with which the pressurized water squeezes and roars its way through the narrow, rocky gorge. The park is in a remote part of the state that may well require a drive of an hour or two, but there are few things as scenic as a drive through the Vermont countryside, so fill up the tank and hit the road. The area is known for its fishing and bird watching opportunities too. 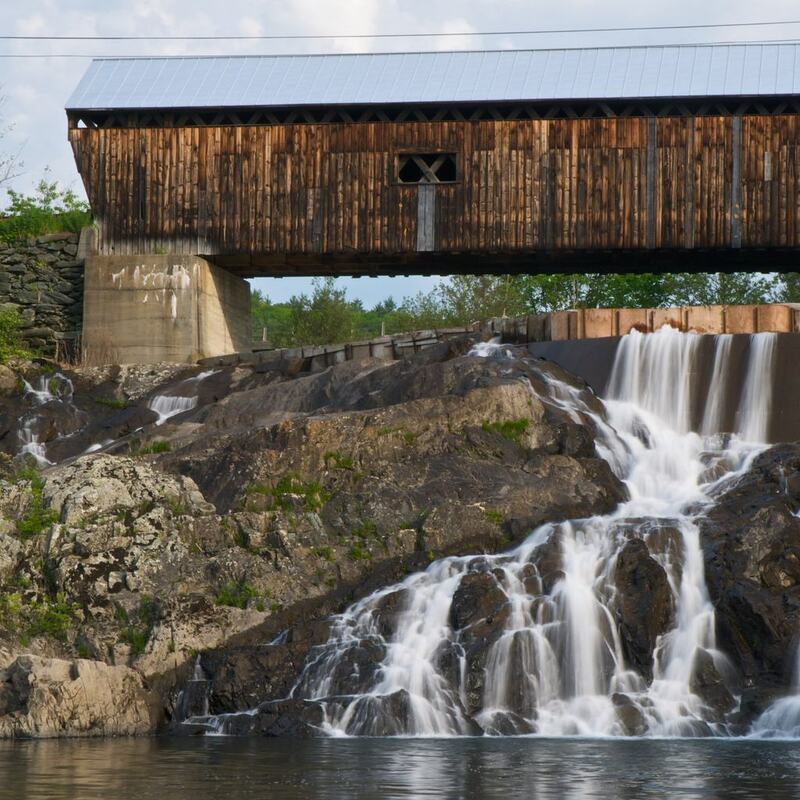 Located in the town of North Hartland in Windsor County, as the name implies, East Willard Falls are accompanied by two amazing covered bridges that are the perfect manmade complement to the river’s natural beauty. 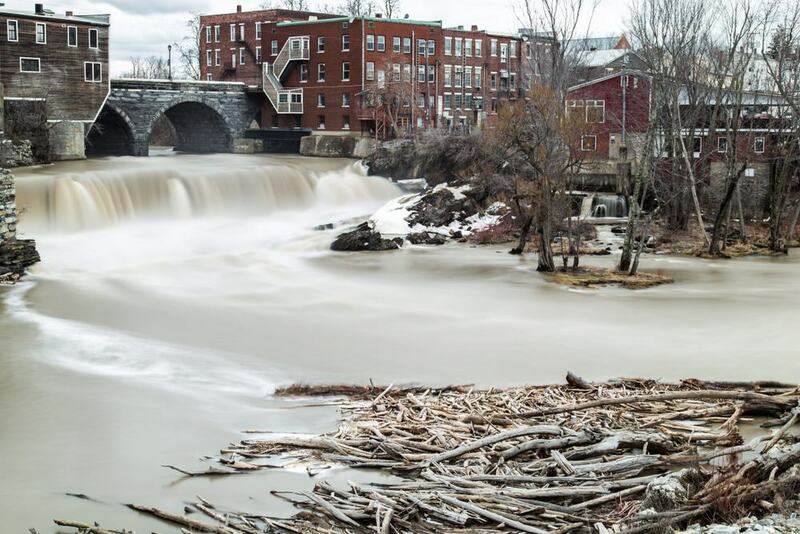 The bridges and falls are on Mill Road where it crosses Ottauquechee River. 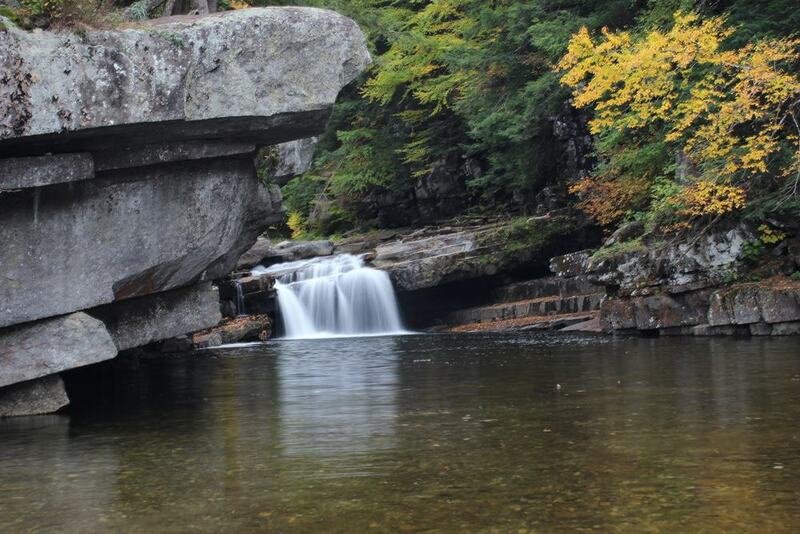 The falls flow about 30 feet over dark brown rock and are picturesque no matter what time of the year you see them. Since the bridges only accommodate one lane of traffic at a time, you’ll need to find a place to pull over a safe distance away before jumping out with your camera. 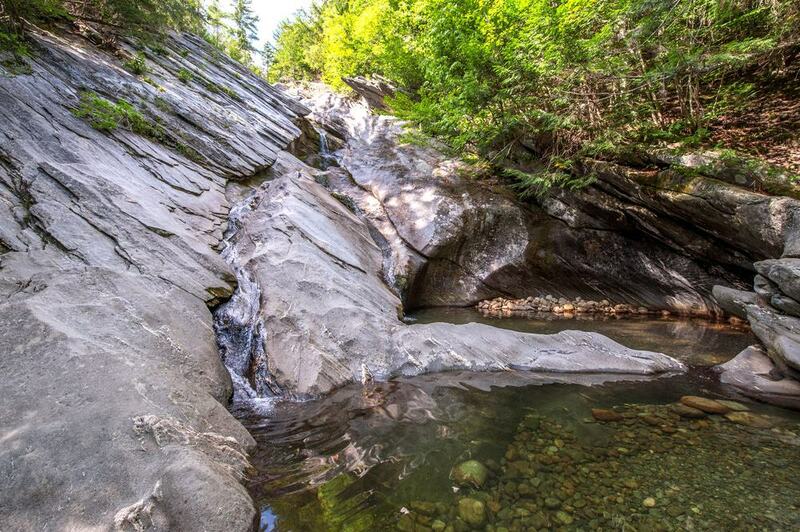 Located in the town of Bristol, Bartlett Falls are easily accessible and alluring to swimmers looking to beat the summer heat. They’re located on Lincoln Road just outside of town, and can’t be missed. If swimming and splashing kids aren’t your cup of tea, try a visit during early spring or fall, when the water is too cold for swimming. The falls’ water flows over slightly askew slabs of flat, layered rock, giving them a unique look. They’re on the New Haven River, and are a good fishing spot, especially in spring when the fish, starving from a long winter with little to eat, spring to life and gorge themselves on anything in sight. They say everything is bigger in Texas, and though that’s open to discussion, Texas Falls in Hancock, Vermont are pretty majestic in their own right. At 35 feet tall, this multi-tiered waterfall is located in the Texas Falls Recreation Area on State Route 125. The trail leading to the falls is a mile-long loop, and is easy enough for everybody in the family. Unfortunately, swimming isn’t allowed, but you’re still able to get close enough to enjoy the falls’ splendor. On the bright side, since swimming isn’t allowed, the falls often aren’t as crowded as others, so with a little luck you may just have the place to yourself. The town of Stowe is famous as a winter wonderland, where skiers from all over America congregate to swoosh down the area’s dramatic slopes. 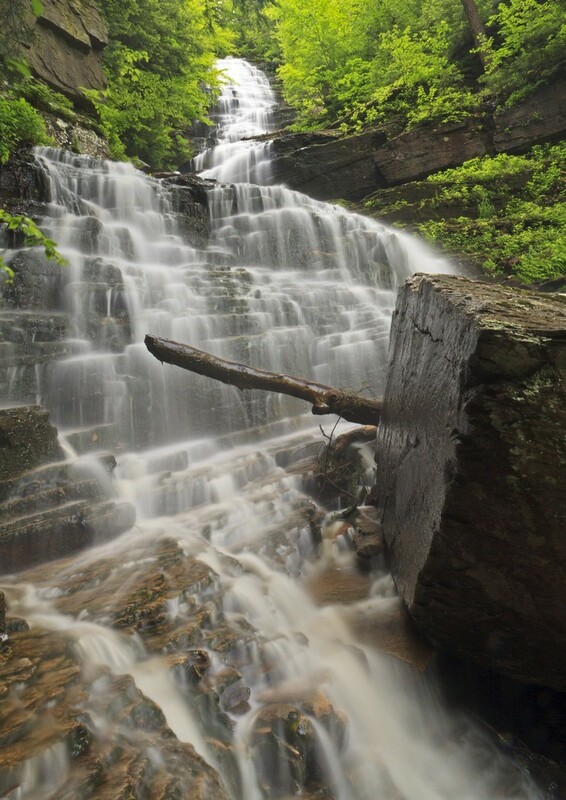 It’s also home to a few notable waterfalls, one of which is Bingham Falls. The falls are 25 feet tall, and are broken into multiple tiers and surrounded by natural beauty that’ll take your breath away. The hike to the falls is moderately difficult, but only a half-mile each way. Although the pools below the falls are great for swimming, they can be a bit treacherous when the flow is at its greatest in the spring. The town has plenty of restaurants and shops that are worth a look when you’re done communing with Mother Nature. Not all trip-worthy waterfalls are renowned for their impressive height, breadth, or the sheer volume of water flowing over them. If you’re like me, and prefer secluded, off-the-beaten-path waterfalls, then Green River Falls in Green River Reservoir State Park should be on your list of things to see in Vermont before you die. Plan on stopping at the falls on your way to the state park. They’re a great place for some quiet contemplation, a few photographs and a little bird watching. If camping and canoeing are your things, the park features camping areas that are only accessible by canoe or kayak. With an overabundance of falls named Moss Glenn Falls, this one is in the town of Granville, and not to be confused with the one in Stowe. At about 35 feet, this Moss Glenn Falls is smaller than the other, but its beauty and ease of access more than make up for what it lacks in size. It’s also located on Vermont Route 100, which is often referred to as the state’s most beautiful highway, for its rolling, forest-covered hills and mountains. The falls are visible from the road if you’re on a tight schedule, but parking is available if you’d like to get out and stretch those legs. The view from the footbridge below Otter Falls may make you feel like you’ve stepped a few centuries back in time. Located in Middlebury in Addison Country, the falls are among the most scenic you’ll see anywhere. Their total fall is just shy of 20 feet, but they’re much wider, and are framed by a few of the town’s building and a beautiful, arched stone bridge that looks like it’s been there for ages. There are a few restaurants and shops on the town’s main street, so find a place to park and do a bit of exploring. 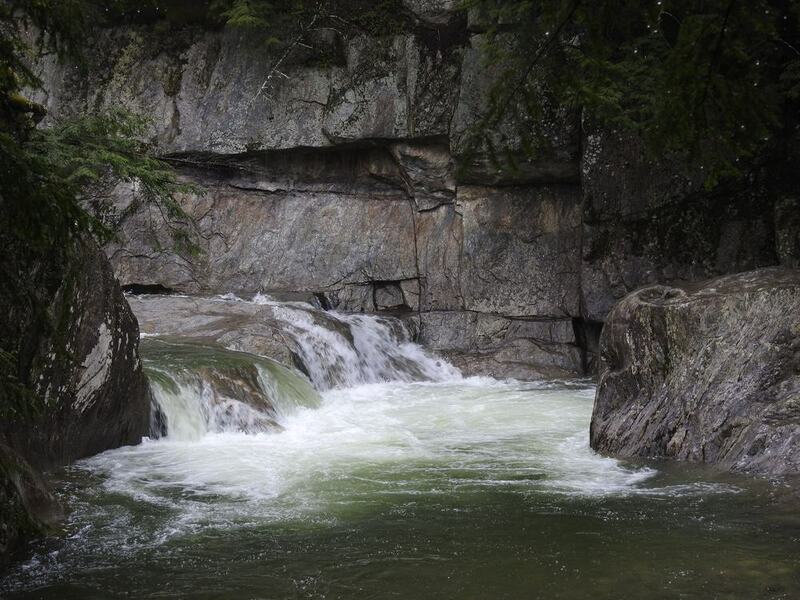 The falls are on Otter Creek, which is a favorite spot for fly fisherman. 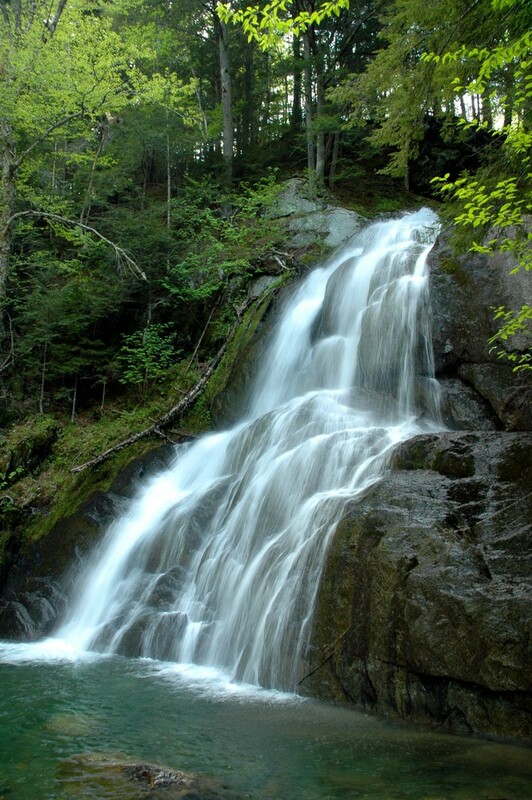 Located in Warren, Vermont, Warren Falls are straightforward but beautiful falls that drop about 20 feet. The falls’ cool green water make an appealing contrast to the surrounding grey boulders. They’re a popular recreation spot in the warm summer months, so if that’s when you’re going, don’t expect to have the place to yourself. They’re easily accessible, and if after a swim you’d like to find a quiet spot, there are ample trails that’ll lead you to more remote areas that see less foot traffic. 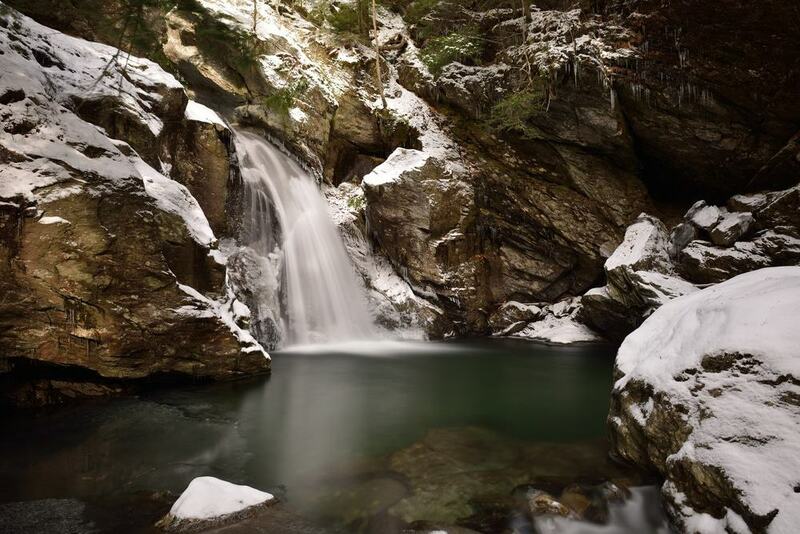 Located in town of Salisbury in Addison Country, the Falls of Lana drop nearly 100 feet through the dramatically rocky and forested precipice over Sucker Brook. 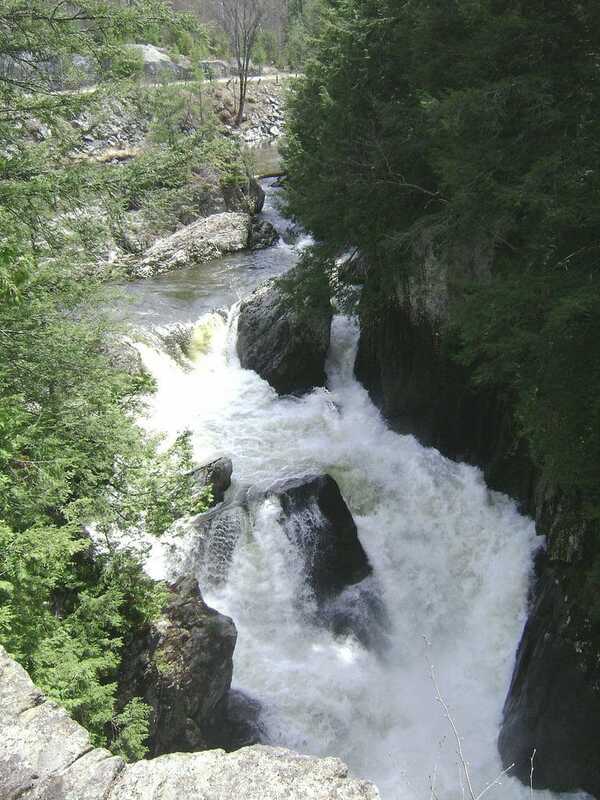 They’re located in the Moosalamoo National Recreation Area, and like most of Vermont’s falls, are free to visit. The falls have 3 distinct sections, each of which is accessible by trails that in total length are less than a mile long. Due to the area’s harsh winter weather, it’s best to plan your trip in the spring, summer or early fall. The area is beautiful year-round, but particularly so in September and October when the leaves are changing color. Just because the next falls on the list are in a town called Jamaica, doesn’t mean you should wear that ratty Bob Marley tank top that’s been hiding in your bottom drawer since your trip to Ocho Rios. 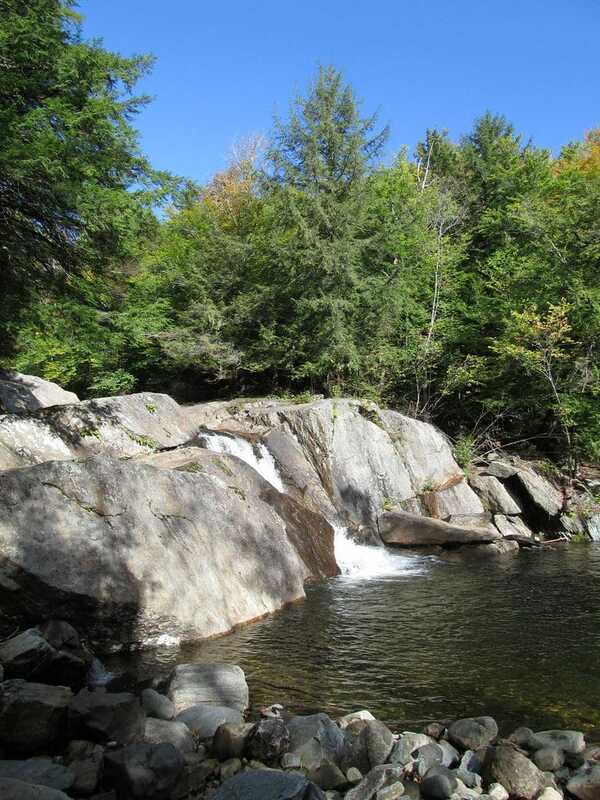 Located in the Hamilton Falls Natural Area in Windham County, the falls drop nearly 130 feet over dramatically large slabs of grey rock, which if the flow isn’t too high, are great places and lounge and catch some rays. The hike to the falls is less than a quarter of a mile. These falls are a great place for a family outing. Near the town of Ludlow in Windsor County, the scene from below Buttermilk Falls looks like a priceless watercolor found in your grandma’s attic. They’re located in Okemo State Forest, and consist of 3 distinct portions, which together fall about 25 feet from top to bottom. If you’re worried that such a modestly-sized fall won’t be worth the trouble, guess again. The falls have multiple pools, all of which are easily accessible and perfectly swimmable, though the water can be downright chilly even in summer. Bring your fishing rod if you’ve got one, because the area is noted for its fishing. 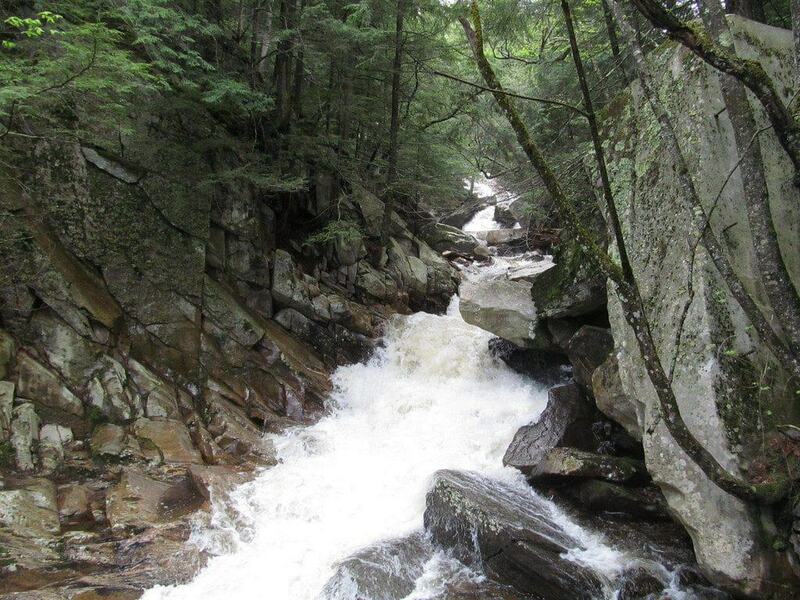 In the town of Killington, which is famous for its ski resort, are the Thundering Brook Falls. They’re located on the scenic Appalachian Trail, which winds its way thousands of miles down the ancient mountain range in the eastern portion of the United States. The falls are comprised of two distinct falls, the lower of which has an 80-foot drop, and combined they’re nearly 125 feet. There’s a raised viewing platform that’ll give you a clear look at both portions of the falls, and since the falls are easily accessible, they’re a great place for a family hike followed by a picnic.